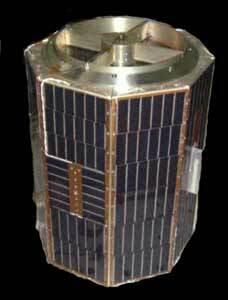 Simplesat is an engineering experiment in the form of a small satellite. It will try to determine whether an inexpensive satellite can be constructed from commercial parts and survive in orbit. It contains a GPS receiver capable of determining the orientation of the satellite. This orientation information will be used to try to control the pointing direction of the small telescope onboard the satellite. It was deployed from a HitchHiker can inside the Shuttle's payload bay by a spring ejection system Simplesat was planned to orbit the Earth for about 5 months before atmospheric drag will cause it to re-enter. During that time engineers at will attempt to communicate with Simplesat using ham radio style equipment. After deployment, no contact to Simplesat could be established, probably due to a transmitter failure.